Here is a little more about Brooklyn Hoskins who will be running at the BOTB in August. Where did you and Susan Hoskins qualify? We qualified at the Last Chance Show in Edinburgh, Indiana. Tell us a little about your horse: Lightnings Riley “Riley” is a 14 year old mare by Lightning Sugar Bull. I bought her almost two months ago and prior to that she had been standing in the field for 3 years due to the owner not having time to ride her. 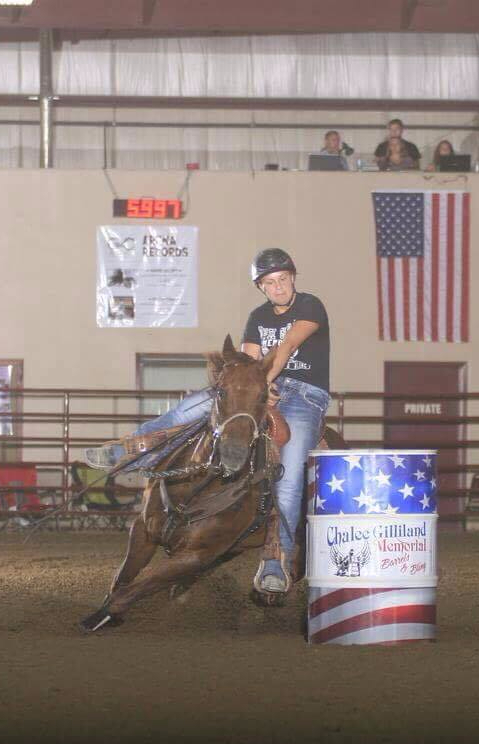 She is little and has a huge heart but yet has that sassy mare attitude and demands everything to go her way. I love riding her and can’t wait to see how far we go. Everyone has a favorite place to run, tell us what yours is: My favorite arena would have to be Hoosier Horse Park in Edinburgh. I always seem to have good runs there and somehow get in the money. Each year we all love to attend a favorite show, what is yours? I actually really liked the Last Chance Show. I was able to get some last minute points, qualify for the BOTB, go on some fun adventures with my friends, and get ice cream everyday! Give us a little more insight about you and your horse: Would have to say my best pal Nicole Fields inspires me. I wish to one day be as funny as she is and eat as much ice cream and cheez-its as she does. She also told me I had to qualify for the BOTB so she wouldn’t be the only one so here we are. But on a serious note, I have too many people to mention that inspire me.